In August 2018, we published a photo which was part of a local history collection donated by the family of Bill Hammond. 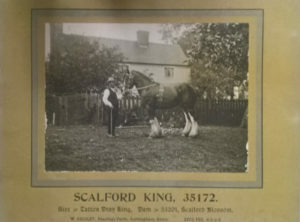 It showed Scalford King, a shire horse owned by W Gridley of Fearings Farm, Corringham and advertised for stud. 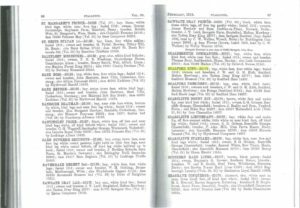 Mr Gridley does not appear to have been a member of the Shire Horse Society, but his horse appeared in the 1918 edition of the stud book and was foaled in 1916. This confirms that the photo and advertisement date from between the two World Wars. 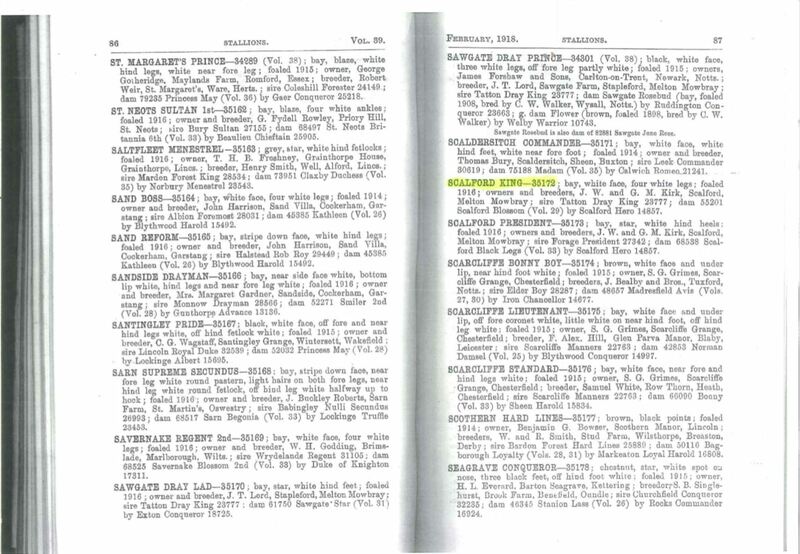 Many thanks to Angela Whiteway of the Shire Horse Society for providing this image of the stud book entry. This entry was posted in Corringham on April 10, 2019 by rjm. 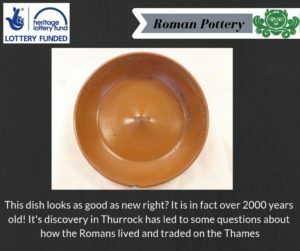 In February and March 2019, Thurrock Museum held a vote to decide which object from their collection would be featured in a travelling exhibition. One of the candidate objects was a Samian ware dish found on the Thames shore at Tilbury. The Thames became tidal at Tilbury during the Neolithic. At that point or shortly after, a natural salt marsh was established, replacing the previous woodland landscape of oak, alder and hazel. This salt marsh was exploited during the Bronze and Iron Ages for salt making and (probably) fishing and grazing. The Tilbury marshland was sufficiently remote that it attracted at least one hermit – Thomas the hermit was there in 1161. 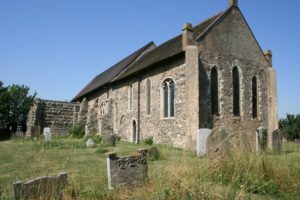 The hermitage was eventually suppressed by Henry VIII in the 1530s, although it is not clear whether there was actually a hermit continuously on the site throughout the period from 1161 until 1540. However, between the early and late Roman period, the river level dropped by about 1.5 metres. Since by this stage there was a mature salt marsh that only flooded at the highest tide, a drop of river level of this magnitude took the marshes well above the level of the high tide. These 3rd century water levels, significantly lower than now, made it possible to establish a settlement in what later reverted to salt marshes. This permitted prolonged occupation and probably arable farming. Evidence for a Roman settlement in Tilbury was found while the docks were being built. The archaeological evidence illustrates life during the Roman period. Roman tiles and pottery, with bones and food refuse, oyster and snail shells, tiles and flint blocks were all observed. These finds were on a “mossy and grass-grow surface” at a depth of 7 feet (just over 2 metres). This is almost exactly the depth at which Devoy notes a peat layer which he dates to 1750 BP (roughly AD 200). Peat is not produced in a salt marsh. Romano British occupation of the marshes is supported by Jonathan Catton who noted that in 1920, 3 hut circles (dated to 1st or 2nd century AD) were discovered on the East Tilbury foreshore below the current high water mark. Unfortunately, the location is now lost under a land fill site. This entry was posted in Chadwell, Roman, Tilbury, Tilbury Docks on March 2, 2019 by rjm. Cambridge University has a collection of aerial photos taken at various times after the 2nd world war. They are beginning to make digital versions available on-line. The first of these have been released and contain some images of Thurrock. For example, here is a link to the aerial photo of Tilbury Fort, taken in 1964 and shown below. The initial release covers approximately 1,500 of the 500,000 images in the collection. Low resolution images can be downloaded through the site for research or educational use. There is more information about the project here. This entry was posted in Aerial Photos, Maps, Tilbury on February 24, 2019 by rjm. The fighting in the Great War ended more than 100 years ago, but participants in that war are still being recognised. Sometimes bodies are recovered on the former battlefields of France and Flanders, but discoveries are also made closer to home. 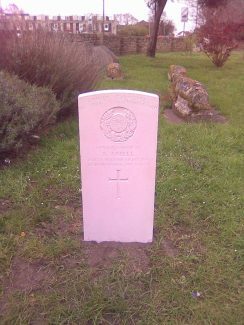 In 2012, a new Commonwealth War Grave headstone was erected in Chadwell churchyard in memory of Stanley Ansell who died in 1919 and is buried in the churchyard, alth ough the exact location of his grave has been lost due to imprecise records. Alfred William Ansell was the son of William and Catherine Ansell of Tilbury and husband of Emmie Ansell of Paddington, London. He was a reservist who was mobilised in August 1914 and served in the Royal Garrison Artillery. He saw active service in the BEF for about 18 months. He was discharged in March 1916 as no longer fit for active service and died on 31st July 1917, aged 30. This belated recognition is due in no small measure to Geoffrey Gillon, who has worked hard to persuade the CWG that Gunner Ansell deserves a memorial. Geoffrey is a volunteer with the “In from the Cold” project which is dedicated to recognising the sacrifice of the thousands of men and women who died in the service of Britain and the Commonwealth during two world wars and yet have no official recognition. This entry was posted in Chadwell, Great War, People on February 19, 2019 by rjm. The family of Bill Hammond recently donated his local history collection to the society. It includes books, photographs, postcards, newspaper cuttings, research notes, correspondence and display materials. The collection particularly covers Corringham and Fobbing, but also includes Thurrock more generally, Basildon, Essex generally and a few other areas. Among the interesting items in the collection was this advertisement for the stud services of a Shire stallion owned by W Gridley of Fearings Farm, Corringham. A few of the items from the donation will be on display in the Heritage Zone at the Orsett Show on 1st September. Some of the books in the collection are duplicate copies of local books. These will be on sale in the Heritage Zone. 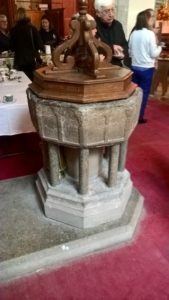 This entry was posted in Corringham, Fobbing on August 28, 2018 by rjm. 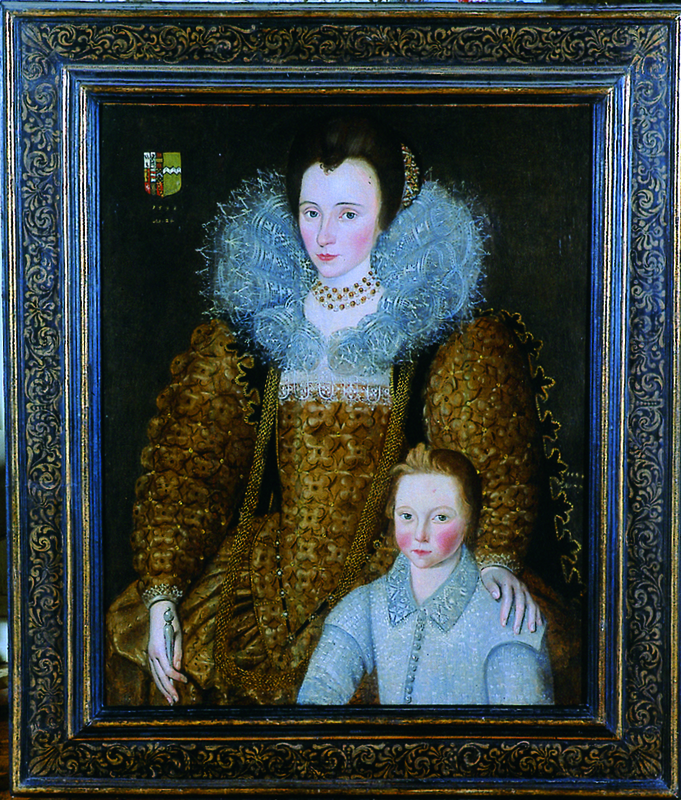 This month (April, 2018) saw the publication of Rosemary O’Day’s magnificent (if expensive) account of the Temple family of Stowe (An Elite Family in Early Modern England, Boydell Press). The book focuses on Sir Thomas Temple and his wife, Dame Hester, but, having been born at Stowe, Sir Alexander Temple of Chadwell is one of the minor characters. Sir Alexander’s children – James, John and Susan – appear only in a pedigree, but his stepson, Thomas (later Sir Thomas) Penistone has a more significant role, having married Sir Thomas Temple’s daughter, Martha. Sir Thomas Penistone was among a large number of gentleman in the retinue of the third Earl of Dorset – “one of the seventeenth century’s most accomplished gamblers and wastrels” according to Robert Cooper in The Literary Guide and Companion to Southern England (Ohio University Press, 1998). O’Day chronicles the ensuing affair between the Earl and Martha using Temple family sources as well as the diary of Anne Clifford, the Earl’s wife. The family appear to have turned a blind eye to this liaison. The affair ended in January 1619/20, when Martha was taken ill while at the house of Sir William Andrews (the husband of her sister Anne). She was taken to Stowe, but “my sister Penistone dyed at Stowe of the small pockes upon Friday night about 11 or 12 of the clock, being 14th January”.(p. 270) Sir Thomas Penistone remarried, but continued on good terms with his step family, and in 1633, his step-sister, Susan (who grew up in Chadwell), chose him rather than her brother James as a trustee for her marriage settlement when she married Sir Martin Lister. O’Day’s book is a tour de force, combining the use of the extensive Temple archive in the Huntington Library in California with documents from numerous record offices in the UK. The specific details of the life of Sir Thomas and Dame Hester are used to illustrate and comment on social and political issues of much wider relevance. 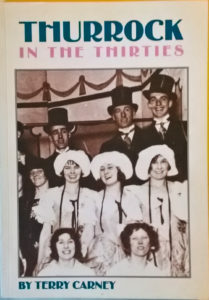 At £75, it is good value but not cheap and it will not be an automatic purchase for its Thurrock local history content. However, it is essential reading for any student of the period. This entry was posted in Chadwell, People on April 25, 2018 by rjm. We learned this week of the death of Terry Carney who was a former curator of the Thurrock Local History Museum – the museum curator had not yet metamorphosed in to a Heritage Officer. He spoke to the society on many occasions including a talk marking the publication of Thurrock in the Thirties, an accompanying volume to his earlier Thurrock in the Twenties. In those days, the museum organised local history walks during the summer. I signed up for the Belhus walk. When I arrived, Terry told me I was the only person to do so. We waited a short while to see whether anyone else turned up, but when they didn’t, Terry and I set off on our own. We had a fascinating couple of hours as he talked about the mansion and visited the ice house. Then he took me in to the woods to see the site of a former pottery. When he retired, I was privileged to be invited to his farewell dinner – at Mumford’s, the fish and chip shop. I bumped in to him from time to time thereafter. Once at the train station, but more often (though not frequently) at funerals for departed Thurrock local historians. The diminishing band of current local historians will say their last respects to him in March. This entry was posted in People on February 24, 2018 by rjm. For many residents of Grays, their memory of the town is buildings covered in grey dust from the local cement industry. The cement industry was an important part of the local economy from the middle of 19th century. The Brooks family brought the industry to Grays and their company provided local employment (under a variety of names) for many years. A prominent member of the family was Herbert Edmund Brooks. He was born in 1860, the son of Edmund Brooks and Ann Marsh. His father, was a Quaker, and philanthropist who was active in Liberal party politics as well as causes such as the anti-slavery movement and famine relief. In 1871 Edmund Brooks founded the family cement company in Grays. This eventually amalgamated with other companies to form the Associated Portland Cement Manufacturers Ltd.
Herbert Brooks worked in the family business rising to become a director of the Associated Portland Cement company. He was also a director of other major companies such as the P&O shipping line. In 1913, he visited India on behalf of the cement company to investigate the possibility of establishing a cement works there. Brooks selected a suitable site, but the plans for this venture had to be put on hold as a result of the outbreak of the First World War. He was prominent in local affairs as a JP and as the deputy Lieutenant of Essex. His many other public offices included Chairman of the Grays Urban District Council and Chairman of the Essex County Council. He remained a county alderman until his death. Brooks was interested in the local history of the area and in 1883, when a denehole was discovered in a company chalk pit, he made a plan of it and invited the Essex Field club to view it. In 1928 he published William Palmer and his School, a history of what is now Palmer’s College. Notes of his research are stored in the Thurrock Library as the Brooks papers, extracts from which have been published in Panorama – the Journal of the Thurrock Local History Society. Herbert Brooks lived for about 40 years in Stifford Lodge which had been bought by his father Edmund Brooks. There had been a house on this site since the 14th century. Although much altered, the house inhabited by Brooks dated back to the 18th century when it was rebuilt by Jasper Kingsman. Herbert Brooks died at the Lodge in March 1931. After his death, his widow lived there for a short while. It was used as a military hospital during the 2nd world war and was subsequently sold becoming the Stifford Lodge Hotel. 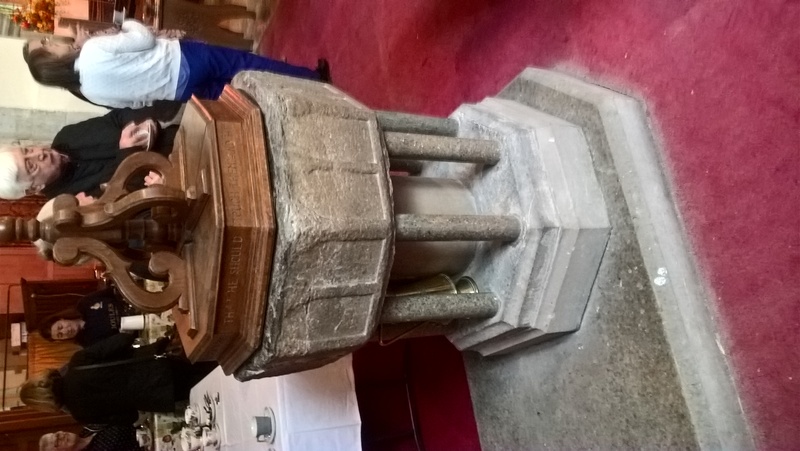 In January 1932, following his death, a memorial to him was unveiled by another local landowner, Champion Branfill Russell, in Stifford church. Later in the year, on the 26th November, Grays Town Council approved the plans for the HE Brooks memorial garden at the top of Orsett Road, which opened in 1933. The garden is still there and now also contains a holocaust memorial. 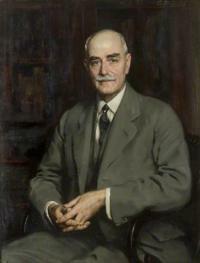 A portrait of Brooks hangs in a committee room at County Hall. This entry was posted in Grays, Industry on November 26, 2017 by rjm.